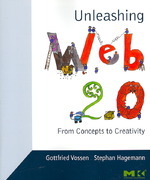 This semester (Spring 2011) I’m taking a course in grad school called ‘Advanced Web Application Development’, and the only required textbook is ‘Unleashing Web 2.0 From Concepts to Creativity’. I bought the book before the start of the semester from Amazon.com (good price and fast delivery) and started reading it the day it arrived. I had read 3 or the 6 chapters by the time the class first met, when I learned that we would only cover those chapters, but decided to finish the book as the material was interesting and I found the material to be an easy read. Let’s check it out. The authors approach is to present the topics and refer the reader to URLs for current information. Chapter One provides history and terminology relevant to Web 2.0. It includes definitions of the 5 types of e-commerce (B2B, B2C, C2C, G2C, B2G), PayPal, and some code examples. There were examples of CSS and XML code – not enough to do more than see a short example, but still useful when taking free online language sources. I particularly liked that the authors mentioned MAMP/WAMP/LAMP – Mac/Windows/Linux Apache MySql PHP/Perl – which developers use to develop and test server-based applications using Apache and MySQL. I also liked how the authors explained Web Services. Chapter Three goes into RIAs (Rich Internet Applications), Saas (Software as a Service – the included diagram is very good), Google APIs, and Flickr. Good data, especially on the APIs although you still need to go to the API websites for detailed information. Chapter Four goes into client-side and server-side frameworks. Our Advanced Web Application Development class has a project where we use Ruby on Rails (server-side framework), so this was interesting but no where near enough for what I’ll need to do the coding so I will pick up a book dedicated to Ruby on Rails development. This chapter also covers MVC (Model View Controller) and has a decent diagram as well as written data on the topic. Chapter Five goes into the business-side of Web 2.0. It breaks down the types of commerce that (as of 2007) is done using Web 2.0, and this is the main section I’d love to see updated to 2011, as there are probably a few new ones that came out since this edition was released. Chapter Six is on Semantics, which I just started and will add that information when I finish the book. For now, I liked this book. I like the approach of referencing many free online sites that will have more current information than books several years old. I will keep this book on the bookshelf, even though I have many pages of notes I made while reading the book (who wants to memorize hundreds of URLs). Reasonable priced: check out Amazon.com for used copies if you’re watching your book budget. There is a version available for the Kindle. I don’t own one, but understand some students are going the ebook route as often as possible to save money and weight. Excellent references to many internet sites with relevant Web 2.0 information. Most of the URLs I checked for Eclipse add-ons or plug-ins were still available. The content flows well – not disjointed, which does occur with books that have multiple authors. The book was published in 2007, and 3-4 internet years is like 50 human years. I’d love to see this book updated with 2011-current information. I bring this up is that some of the Eclipse add-ins did not work with Eclipse Helios (although they did with Eclipse Galileo). Only provides code snippets, so you need to buy other books to learn more about the programming languages mentioned in the book – to be fair, there are enough internet sites on the languages that you don’t need to buy a programming book, but I prefer to learn coding from old school printed books. Recommended buy for developers or managers that want more understanding of Web 2.0 technologies. This is good book and it was worth the time to read it for my class, as well as to come up to speed in Web 2.0 technologies and terminologies. I liked the approach of providing an overview of topics while providing URLs, which should have more up-to-date information than printed books.